Welcome to Where Bloggers Create blog party http://www.mydesertcottage.com/. 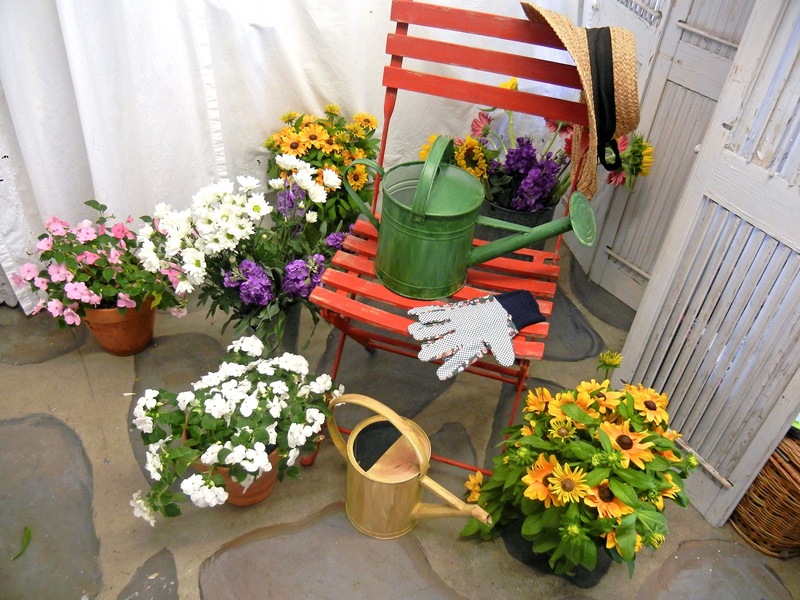 My garden gate is always open for you to come in and sit and relax while I share with you my creative spaces. I am an artist living in Southern California where the weather is beautiful almost all year. I spend most of the time creating and painting outside in my little garden and consider my garden as my primary studio space. I feel I can get closer to my subject mater if I can actually smell the flowers, see the blue sky and experience the garden. I would love to share with you a few of my favorite places that inspire my art and where I create and paint in the garden before we visit my indoor studio space. Let's meet Bentley, My Studio Assistant, in the garden to show you my "garden studio" where I spend most of my time creating and painting and the simple and everyday objects that end up in my paintings. Have a seat and relax for our little tour of the spaces in my garden where I create!!! Or . . . have a seat here! I paint lots of white wicker and use the wicker chairs in my garden as inspiration - I add a table or change the colors of the cushions and pillows -here is where the paintings starts - in my garden . I usually add the ocean or Newport Bay as background as I live near the water and love to add it to my art. I like to paint the simple everyday beauty of God's creation - simple flowers and objects and love collecting bird nests to add to my still life paintings ( none of mine are real ). I am working on this painting and added a bird nest. I love painting Pansies and grow most of mine in containers. They do well in my part of the country and usually last until July when it gets hot in Southern California. Mine are just starting to fade and I am busy painting them before they are all gone. Another nest ended up in the Pansy Painting. 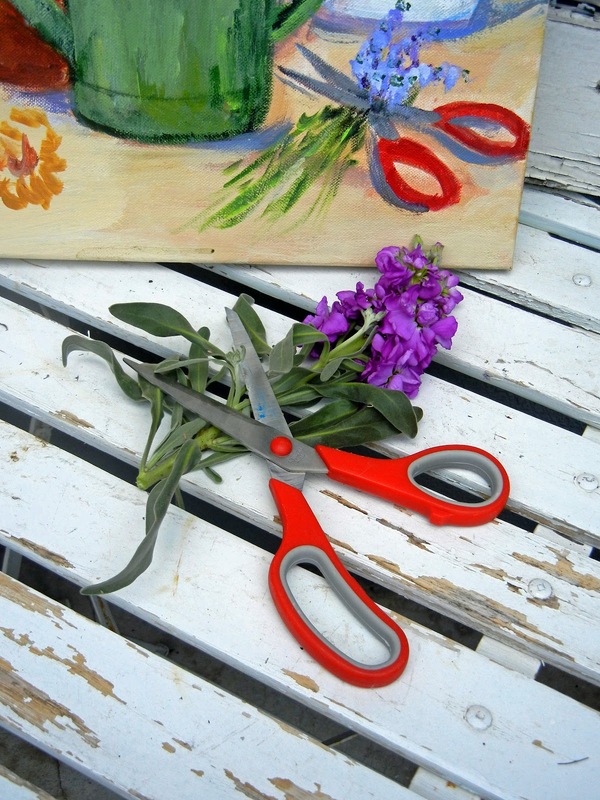 Even my red scissors end up in paintings! I put together a variety of of flowers from the market to paint the Flower Market painting .If I don't have enough flowers I buy them from the market that have reached past their prime - just ask to buy them - they are perfect for paintings and very inexpensive. I bought the sign at World Market and waited until it was marked down 50% - I am inspired by it and love it in my garden as it makes me feel like I am painting at a real flower market. 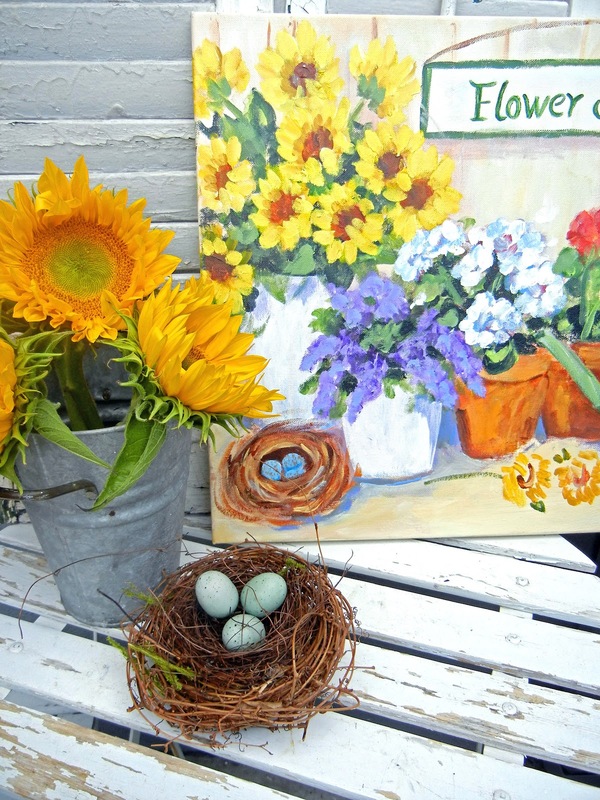 Sunflowers are so happy and almost always end up in my paintings . Bentley loves to stop and smell the flowers!!!! 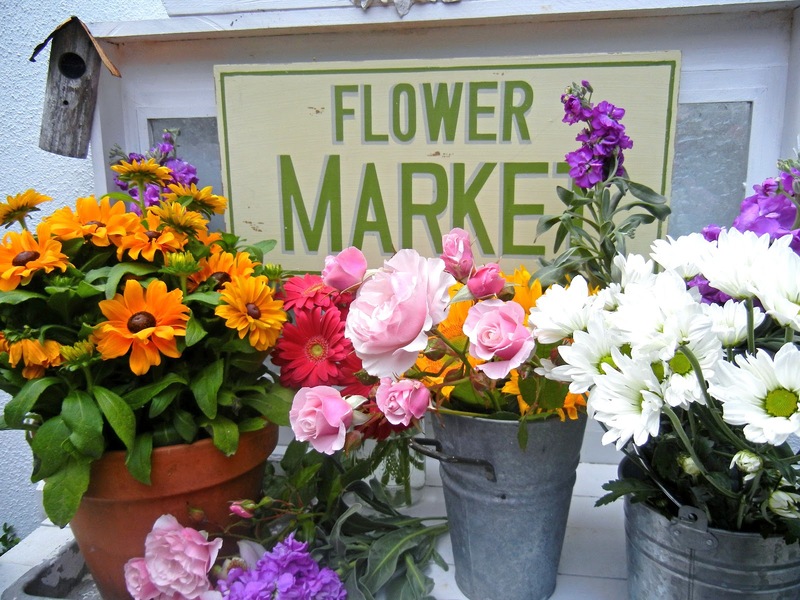 My just finished painting inspired by new Flower Market sign and the flowers I put together in my garden studio. Today I am painting the old watering cans and garden hat hanging on a shelf in my backyard - simple every day subjects. I am still working on the little bird and then it will be finished! We are going to take a little detour so I can share another favorite creative space -some of the Roses in my front yard as they are always a favorite to paint this time of the year. My front yard is planted in pinks, whites and lavender and my back yard is planted in primary colors of reds, yellows, blues and whites - that way I have a big variety to choose from. Would you like to have some cool lemonade before we go inside? Now let's go inside to see the other space where I create and store my art supplies. I have a very large double garage with lots of built in storage cabinets. About ten years ago I painted the concrete floor to look like flagstone with brick trim and turned half of it into an art studio. This is where I store my paint, books, canvases, etc. and paint on the few days a year when the weather is too bad to be outside in my garden studio. 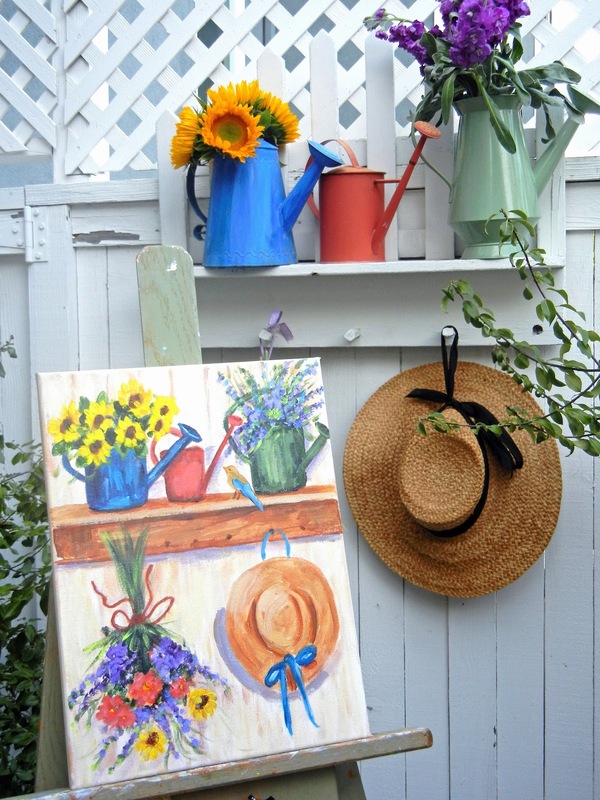 I painted this painting to hang in my indoor art studio as it represents so many things I love to paint - Sunflowers, Lilacs, a painterly bouquet of flowers, a garden hat and blue and white tea set. The photo quality of my indoor studio is not good due to the fluorescent lighting - it does not work well with my camera flash! The old green work table is used for creating and the red curtain hides storage boxes. 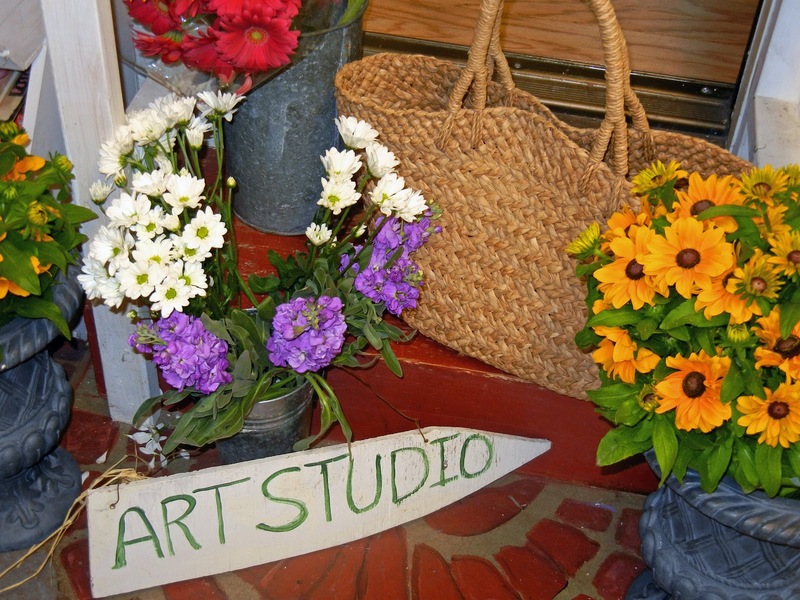 I use the market umbrella at outdoor shows and store it in the studio - it is fun to sit under it and create! I collect vintage watering cans that all end up in my paintings. The white cupboard on the left of the table is used to store old mismatched china and flea market finds that find their way into my art. I use a lot of old shutters as dividers - they were found in the trash as well as the old cupboard - all free! One day I am going to try my hand at mosaics with some of my flea market china finds! OK- here is a peek into the old cupboard that stores flea market finds that I use in my paintings- I know it is a little messy but there are lots of great finds!!! The stacking storage boxes came from Joanne's and they are great for storage. The old white cabinet holds my paints and art supplies. More curtains hiding stuff - the shutters on the right make a nice divider. 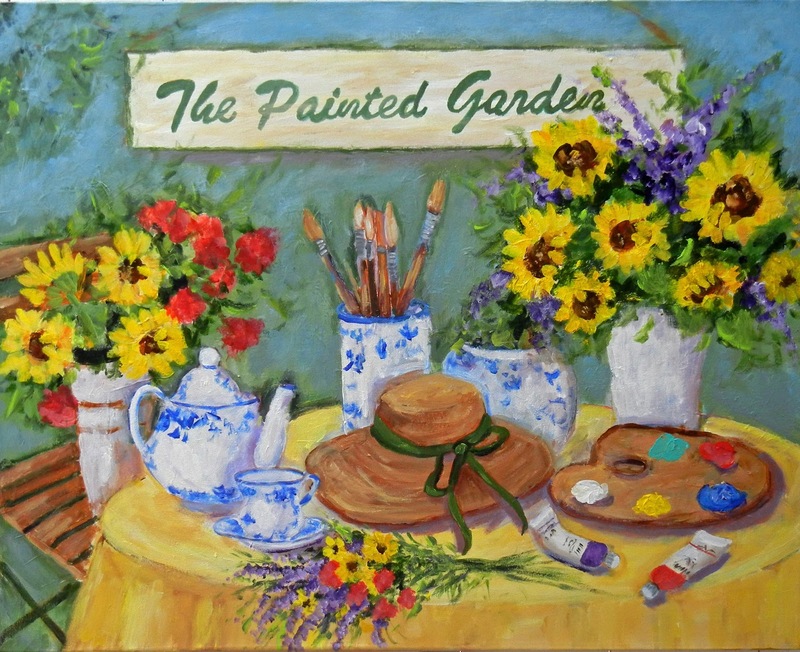 The red chair, watering can, garden gloves and hat can also be found in some of my paintings. I love having everything out on display as it inspires me and gives me new ideas for future paintings and at the same time I can use it when I need it. Thank you for stopping by. I loved sharing my creative garden and indoor creative spaces with you and hope you will come back to visit. Please let me know if you have any questions or would like to see me paint something special. We will be painting a Fall Welcome sign together in September and I will have a simple tutorial for you as well as creating a Christmas door greeter in November with a simple tutorial. I can see why you call your garden your actual studio, because it seems like it would be VERY easy to get inspired and creative out there! I love your garden and your paintings. I wish I had that talent, because then I could paint scenes from my garden and be able to enjoy it through the long cold winters! I enjoy reading your blog and wishing I had a garden like yours. You are very talented with a green thumb and an inspiration. Your home and garden studio are so beautiful and inspirational. I love your paintings!! Thank you for the beautiful tour. All is so lovely and very inspiring. I particularly love your "My painted garden" painting. It is really a success. You have a beautiful garden and I love what you have done with you blog. It's easy to see why you enjoy painting outside in your garden. It is so beautiful and charming. The flowers all look so vibrant and healthy and I love the touches of whimsy. Your paintings are all so beautiful and your assistant is adorable! 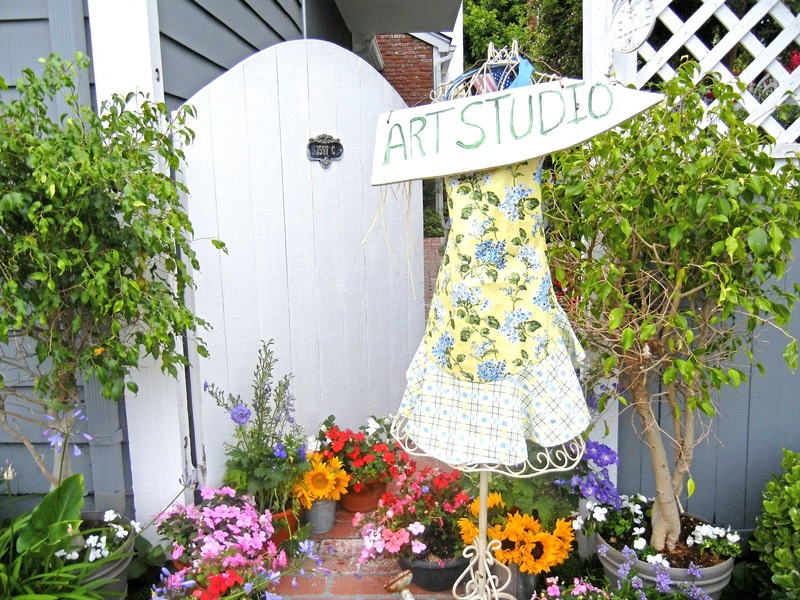 Your garden and your studio is so beautiful, I always enjoyed the weather in Southern California and the beautiful flowers. So many different flowers, your paintings are beautiful. Are they for sale? I'm interested in purchasing one. Erin -- I am in awe of your beautiful home. I think you are so blessed to have a talent that allows you to create so beautifully sitting in your cottage gardens amongst your flowers and treasures. Seeing the way you use your inspirations in your paintings is such a wonderful insight into the person that you are and the way that you create. 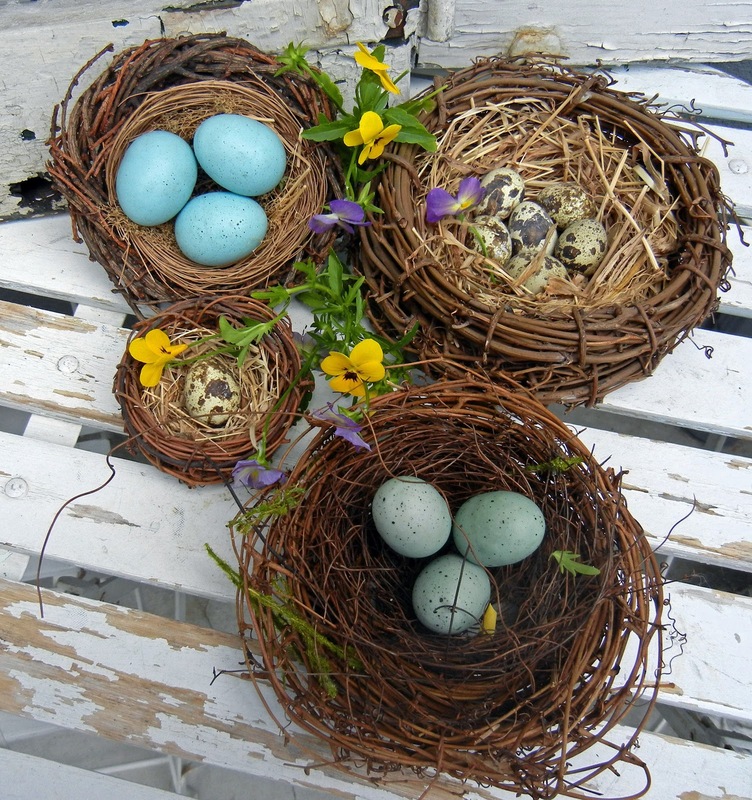 I love the birdnests!! 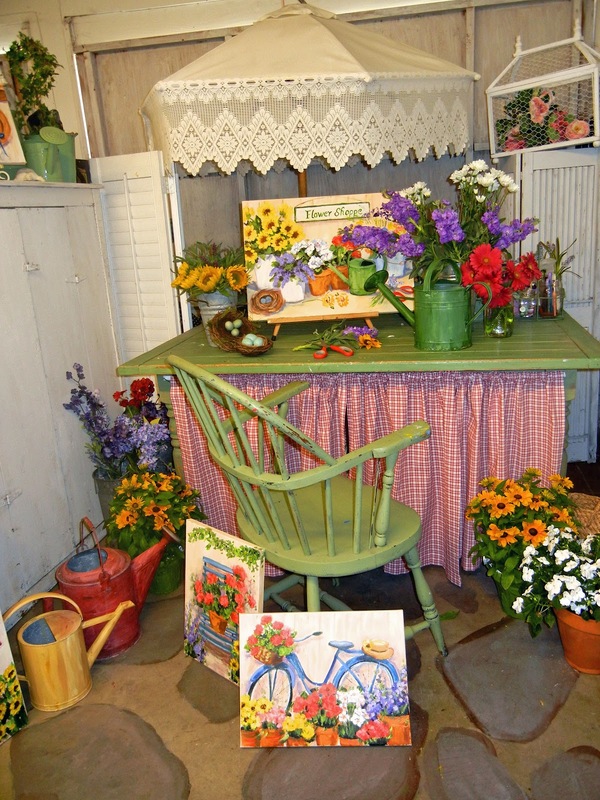 And the wicker -- and the beautiful flowers -- and those sunflowers!!! And your garage room - totally exquisite -- love the floor and that cabinet full of vintage "prop" treasures for your paintings. Erin -- you are blessed to have such a way with colors and the ability to paint so beautifully. Please give Bentley a hug from me - I think he is adorable. And your beautiful new blog header---!!!!! It is amazing - and just screams beauty and color and WELCOME to all your visiting friends!! Ok, now I've got Garden Envy! cheery and makes me smile a lot! not one bloom going on! Love your happy post also. Hi Erin, I loved seeing where you create your lovely paintings...such pretty spaces, no wonder you have such wonderful inspirations. Great work too of course. Wow! your garden is truly inspiring! What a wonderful little world you have created there. An artwork in itself. Erin,I love your garden, your home and your paintings, what a lovely tour this was. I live not too far from you, only I'm up in the mountains near Lake Arrowhead. It used to take me about an hour to get to Newport Beach, now it takes up to three! It's amazing how much traffic has increased over the years. What a colourful paradise you have created for yourself! I can see that you are a fun loving person through all of your bright cheery colour tones. I love your paintings too...full of whimsy and happiness! thanks for sharing. stop by to visit if you like...i'd love to have your company. I sooooo enjoyed this tour of your creative space!! I love gardening and flowers and just marvel at your creative way with your gardens and then to be able to paint them on canvas! Just lovely and so cheery and fun! Hope you might come by and see my new space! I am drooling over your lovely garden area. We used to live in San Diego and I so miss being able to be outside all the time. Your paintings are lovely and so is Bently!! Absolutely gorgeous - and I love your assistant, too!! Thanks for sharing your beautiful space. Good morning Erin~your garden and creative space is beautiful! Thank you for sharing with us. Your garden is absolutely breathtaking as are your beautiful paintings. Visiting from WBC. Beautiful photography! Your garden is just lovely and the puppy is so cute. Enjoyed seeing all of your spaces today. Very inspirational! Your work is fab, your garden incredible and Bentley... well, I just want to HUG him forever! How sweet is it all. I love it! Thank you for sharing your beautiful space with us. Your space is magical - just magical. 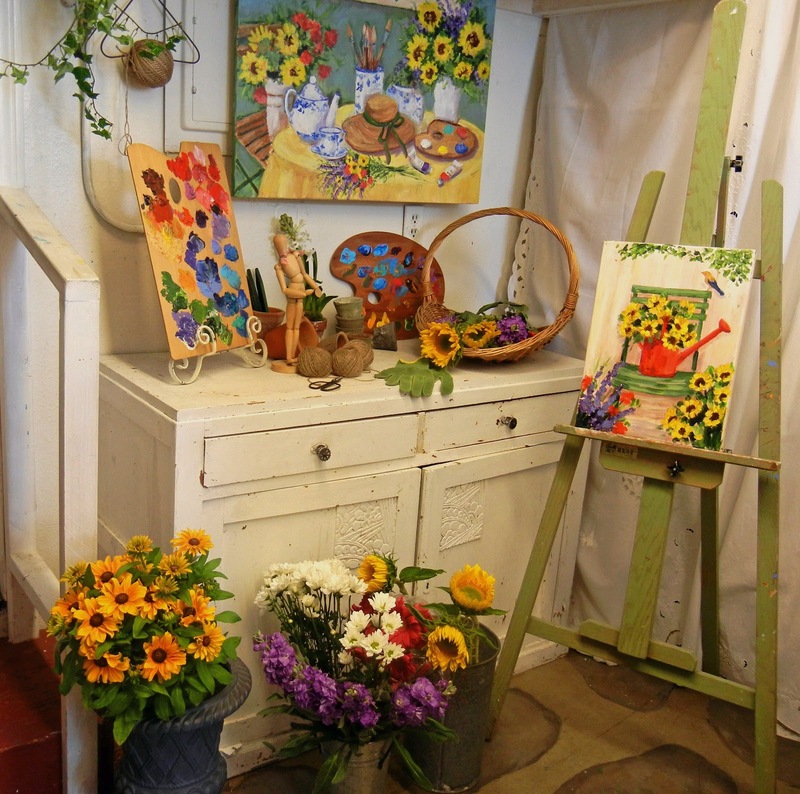 I love your garden studio and I love your paintings. SO beautiful and colorful. All of the vintage things just add to the charm. I wish I could paint!! I just love how bright and cheerful your place is. These pictures should be in a magazine! What a vibrant and colorful place. I loved my visit here! Thank you for sharing. Oh, Erin, this is heavenly. I love how you've presented your creative space, your precious garden. I remember the first time I visited your page from my previous blog. Cindy Adkins, my very dear blogging friend, knew I would love your page and she mentioned it to me. Since my blog move, I completely lost touch with your blog but one click on your page and I knew exactly where I was. I'm giddy and delighted to reconnect and you better believe I will be visiting. Glad you enjoyed Love's dressing room tour. Last year I presented my beach room, mainly a couch where I love to write. There are so many beautiful places that spark creativity in our heart. Thank you for sharing one of yours. I absolutely love your blog! You are so Me! The tour of your gardens was outstanding! A great idea to have the more pastel colors in front and bright in the back for a full range of painting. I too am an Artist, more a Folk Artist, and am very inspired by your work! Your camera takes beautiful bright pictures too! Hope you will come visit my blog, I would be honored to have you! WOW and...WOW! What a lucky girl you are to have such a beautiful workspace! All I can grow are weeds! I would love to have those beautiful flowers outside my doors! I love your paintings too! I love, love your garden. Beautiful inspiration for your work. Potting she chic! Love the riot of color explosion in your art and in your garden, stunning! Thank you for sharing. Great post and awesome paintings! You are a girl after my own heart.... sunflowers and lots and lots of color. Your garden is gorgeous and your inside studio is beautiful. Thank you for sharing your spaces and your beautiful garden.... Give Bentley a little scratch under his chin for me.... adorable. I will become a follower! I cannot wait to see more of your paintings and your garden. I love your bible verses! so amazing and full of color. I love your post and your palatte. Love your blog too. Probably the most colorful and fun blog I have ever seen. It radiates happiness! Beautiful, Erin! Inside and out. I love how you've brought your garden inside, too. 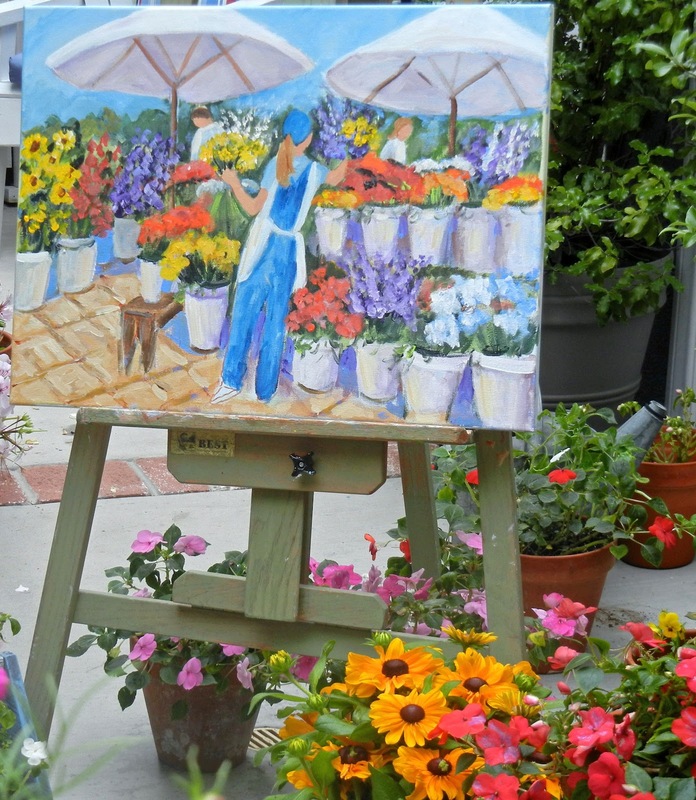 So great to have a "studio" outside, too, to paint all those beautiful flowers. Your gardens are gorgeous. Thanks for sharing your tour! Your garden space is absolutely adorable! ...and I love your paintings. I will check out your Etsy shop. Thanks for some styling inspiration. i like it .beautiful garden. Dearest Erin, I have been a huge fan of yours since the first time I ever laid eyes on one of your paintings!! Oh how joyous that you are able to create right in your gorgeous garden (and in your lovely indoor studio space as well - it's absolutely wonderful too!!) Your paintings reflect the joy of your surroundings and allow us a precious glimpse into God's bounty of color and light grace - and that my friend is a gift, and one that I am so grateful that you share with us all!! I wish you continued success with your Etsy shop and all your creative endeavors!! Many thanks for your sweet, sweet words of encouragement you left at my blog - they are treasured! I've strolled from 7/28's Pink Post to here. I just love the blue bicycle and the verse (a favorite). It really echos the sentiments of peaceful wonderful things. I have so thoroughly enjoyed scrolling! I love your art! Recently, I tried my hand at drawing. You can see my drawing on the sidebar of my blog under "The Greatest Love" . . . blew me away to do that out of the blue. Anyway, thoroughly enjoyed my visit! Thanks!! I just adore your style! Makes me happy and smiling all day! I adore your style! Visiting makes me happy and smiling all day!